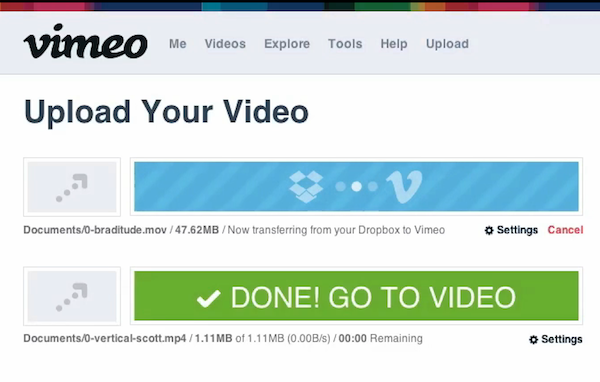 Upload your videos to Vimeo directly from Dropbox. Dropbox is fun, I hope you all are familiar with Dropbox. If you are not I will give a little explanation to it. Dropbox is a service which provides you cloud storage for all your files, and helps you to access it from your desktop, tablets,mobile phones and web. This makes it easy to stay with all your files available always. All your files are placed in a centralised location which can be connected whenever required. From Dropbox, you can now upload your video files directly. This avoids an extra work and time of uploading a video to Vimeo. Follow the steps to know how you can upload the video without much effort. You need to login to Vimeo. Go to My Settings from Me option near the Vimeo image. Grant access to Dropbox and allow the application to access your account. Give Vimeo full access to your Dropbox and assign a folder so that your videos can be directly uploaded from that folder. Now, when you have to upload the video redirect the link from Dropbox. The advantages of uploading the video from Dropbox is that, you need not upload the file directly and when it is from Dropbox it directly gets upload from it. This saves a lot of time, when you frequently upload the files to Vimeo. You need to paste the video file in your Dropbox folder which is assigned, it will get uploaded to Dropbox and will get uploaded to Vimeo without taking much of your time. The video is also safe and gets backed up in Dropbox. I hope you enjoy making the video and sharing it in Vimeo directly. « Access uTorrent from any Android device.